The view from the balcony in St. Maarten. Learning how to Plan for a Family Vacation Without Going Crazy, to Enjoy Traveling, and to Enjoy Family Vacations & Come Back Closer Than Ever all go a long way in making sure your next family vacation is the best vacation you’ve ever had. One theme that hopefully stands out in this series is making sure the time spent away is relaxing for everyone. Without that element, all the planning along with the best activities and locations will fail to produce a vacation that truly energizes and revives. If you come back from a vacation needing to recover from your vacation, did you really take a vacation more than in name only? First, let’s take a look at WHY actually relaxing on vacations is so essential. Health Finds, a blog site providing News and Tips for a Healthy Lifestyle, provides some startling information about the benefits of vacations in the article Why Vacations Are So Important. 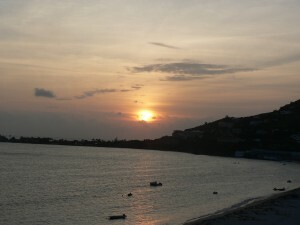 Clearly, vacations are essential for a person’s physical health, but they also can provide tremendous mental benefit. In fact, in Why your brain needs vacation on CNN Health, Elizabeth Landau provides the following reasons for taking a vacation. Visiting an unfamiliar environment can help give a new perspective on everyday life. Traveling abroad helps with creativity through experiencing new cultures. Mindful vacations can result in an “epiphany” and be a catalyst for permanent change. So, to put special emphasis on the idea of truly relaxing while on vacation, the following tips are offered. 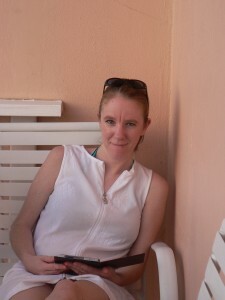 On the balcony with my e-book in St. Maarten. Schedule down time. So often, people schedule activity upon activity when on vacation resulting in fatigue that needs recovery time when they get home. Instead, schedule time to relax. Personally, my family and I schedule as much if not more time to relax than we do actual activities. Truly be on vacation. Simply put, don’t work. Turn off electronics, especially ones that relate to work, and leave projects at home. Shutting out work takes a deliberate decision. It will not happen otherwise. Clean your house. I hate the thought of returning to a messy house. So, my boys know that preparing for vacation includes cleaning the house. Knowing my house is clean allows me to relax more than I would otherwise. Get lots of R&R. Give yourself permission to rest and relax. For me and my oldest, that means reading a lot. My youngest son and my husband enjoy sports. For all of us, that means movies and games together. We also just sit and talk quite a bit, on the balcony if possible. Forget your routine. Allow yourself to sleep later and stay up later if you want. Give yourself permission to have an extra cup of coffee instead of heading out the door earlier. Eat lunch at 3pm if you want. Changing your routine is immensely relaxing and often enlightening. Vacations provide a terrific setting for extra bonding with the family, for exploring new cultures and for learning history. Above all, they can be the perfect setting for true relaxation that does not come with everyday life for most people. Sure, relaxing looks different for every person, but everyone does need to schedule time to relax. For many, it just won’t happen otherwise. This entry was posted in Uncategorized and tagged bonding, deliberate, family, health, intentional, relax, vacation, work by admin. Bookmark the permalink. Yeah, I know. I actually thought of you as I was writing this. So, what are you going to DO about it? My wife would agree with "clean your house." Dishes in the sink have to disappear (they can be in the dishwasher and washed but not put up) because, like you, she hates coming into a mess. We always clean the house before we go, too – the only part of vacation my kids don't like! My wife is the same about cleaning the house. I guess I see it from her perspective, but the last thing I want to do is clean before I go on vacation, heh. But I can see that having so many applications. I know I rest better on vacation when I'm "ahead" a little at work and am confident that I'm not missing anything. More people than I realized want a clean house before going on vacation. Funny that that's the point sticking out to most people. I actually almost turned the point into something more general like applying to work and other situations, but I realized how big of a topic that could be. So, I left it alone for the time being. Glad you pointed out the wider application! I'm going on vacation(Family vacation) next month and plan on applying these points. I plan on relaxing, reading, writing, and spending time with family. #2 is going to be a challenge for me but I know I'll be mostly away from my phone/computer. Great post and thoughts. Lake Havasu(It's in Arizona). It's a week long and during the vacation plan on going to Vegas and also the Grand Canyon (On day trips). I'll try and remember to let you know. Sounds great! Enjoy. We loved the Grand Canyon even at 100+ degrees. Wish I was there! My husband want to go on a guided hike there sometime. Kari, We just got back from a short getaway, and came back a day early just so we could use today to gradually get back into our routine. It's been a wonderful day, and helped keep us from re-entry stress. Your tips are fantastic! Blessings! You actually hit on another suggestion I could have and should have included. We try to get back a day early to actually get settled at home before the "normal" routine begins again. Great added tip!